I can’t do it. I just…I can’t do it. I can’t…review…They Came Together. Don’t worry, I haven’t reached my breaking point. I have just found a film that has rendered itself unreviewable. That is not to say that They Came Together is bad or difficult to understand; it is just to say that is so self-aware that at times it won’t feel like you are watching a movie, but rather two idiots with too much imagination pitching their idea for a romantic comedy. And that is not a diss at all. They Came Together starts with a double date where the story of Joel (Paul Rudd) and Molly’s (Amy Poehler) relationship goes on for a very long time, and turns out to be just like “a corny romantic comedy.” Thus, they proceed to tell the story of the worst romantic comedy possible. They Came Together tries to be bad, and that is what makes it so good. This is the MacGruber of romantic comedies: They Came Together is a very specific kind of parody, in that it is both self-aware and unaware. The dinner table conversations are a way to tell the audience to be in on the joke. The flashbacks play it completely straight. They Came Together is an experiment in only using cliches to construct a plot. They must have had to watch a lot of rom-coms They Came Together feels like it was made by people who have seen way too many romantic comedies, and that is why it usually works so well. The humor They Came Together comes from the much of the comedy team involved in The State and Wet Hot American Summer. Their sense of humor is based less on jokes and more on absolute absurdity. The dead body in the pile of leaves might just induce the most laughs per capita. The best point about romantic comedies They Came Together made me realize why rom-coms can never imitate real life: it is because every character and situation is just meant to service the two romantic leads. Every other character is just there to either stop them, support them (such as the sassy sidekick), or provide a miscellaneous piece of information (like David Wain’s office drone who purposefully is not around for any other reason). The rom-com might be the most selfish genre out there. Amy Poehler What a great lady. She plays both the ditz and the MPDG at the same time and with such ease as well. The surprise on Molly’s face when Joel tells her he also loves fiction books is priceless. I also like the idea that this is a world where, well, not too many people seem to like fiction. Am I watching I Love You, Man? Don’t get me wrong here, I am a huge fan of I Love You, Man. this 2009 bromance starring Paul Rudd and Jason Segel gets better on repeat viewings. 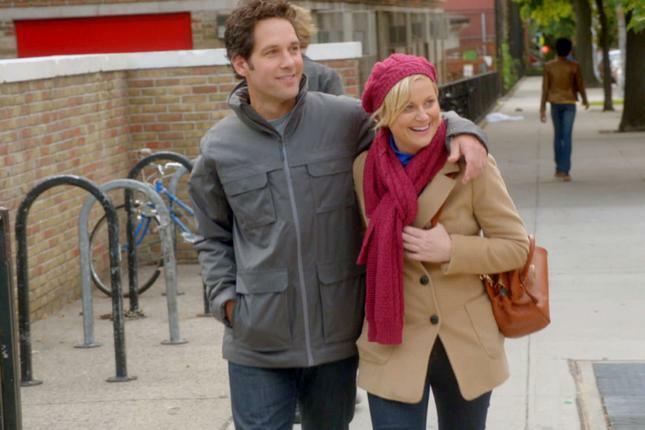 It wasn’t until I watched They Came Together that I realized how many rom-com tropes are in I Love You, Man. The big brother/little brother dynamic in They Came Together felt right out of I Love You, Man. If Paul Rudd is intentionally trying to make fun of himself, then good for him for being a good sport about it. Playing it straight They Came Together has a surprising amount of dramatic moments and they all manage to be hilarious. That is because they are played completely straight and strangely, the more genuine they are, the funnier they manage to be. Nobody understands movie cliches like these guys do. A Room reference? David Wain and Paul Rudd were two of the earliest supporters of The Room before it became the cult classic that it is today. I wouldn’t be surprised if the scene in which Rudd and Jason Mantzoukas throw around a football in the office is an homage to that scene in The Room where they toss around the pigskin while wearing tuxedos. One thing I had trouble with There’s a scene where Paul Rudd goes to visit his Bubee. It is not the Jewish stereotypes I had trouble with (I loved those), but…welll…you’ll see. It just left me feeling kind of weird afterwards, but I think that was the point. It just felt kind of out of place in a film that otherwise chooses all of its scenes and little moments very wisely. How this ranks in the David Wain filmography This does not reach Wet Hot American Summer or Role Models levels, and I have not seen Wanderlust yet so I cannot compare it. Like Wet Hot, this is an absurd and very specific parody that has the makings of a future classic. I look forward to watching it again soon. Why we watch romantic comedies I would like to discuss a little moment towards the end. It is hardly a spoiler, because for a movie like this, spoilers would be ruining the best jokes (which I have tried my best not to do). Basically, the moment I am thinking of shows that the story of Joel and Molly is actually much darker than they make it out to be. But they would rather tell this corny rom-com version. This is why rom-coms exist: it is so much easier, and much nicer, to tell a story where true love exists and only comes with easily avoidable obstacles. I like to rip on romantic comedies a lot, but I am not against this idea of more positive storytelling. Overall, They Came Together is the kind of film that I wish there was more of this summer movie season. This entry was posted in Uncategorized and tagged Amy Poehler, Bill Hader, Christopher Meloni, David Wain, Ed Helms, Jason Mantzoukas, Michael Ian Black, Michael Showalter, Movie Review, Paul Rudd, Romantic Comedy, The State, They Came Together, Wet Hot American Summer on June 28, 2014 by ian0592.